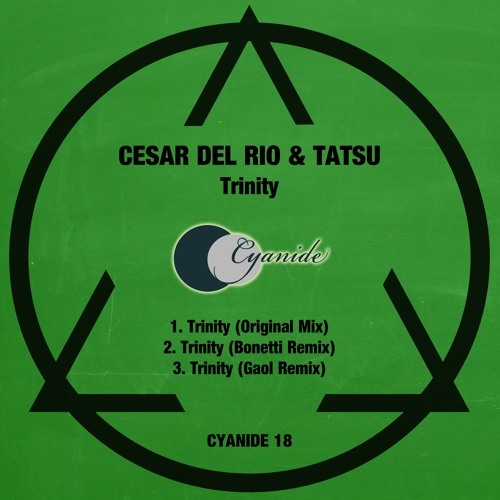 After releases in quality labels like Bla Bla, Silence In Metropolis or MoodyHouse, the Spanish veteran djs and producers Cesar Del Rio & Tatsu team up to delight us with 2 great eps, which will be released in Cyanide before the year goes by. Both will include 2 original tracks and 2 remixes by some of the most interesting figures of the current house scene. In their first Cyanide ep we find “Trinity”, an outstanding deep house track, with a groovy bassline, perfectly accompanied by smooth stabs and crispy analog synths. The first remix comes by the also Spaniard Bonetti, a very common resident of the Traxsource Top 10 lists. Andres has injected a good dose of funk to the original track, converting it into a sweaty piece of jackin’ house, ready to break hips. The second remix comes by another Spanish producer, Gaol. This talented artist has added an acid squared bassline to “Trinity”, having a s a result a version with even more groove than the original track. The perfect icing on the cake to this delicious ep, with a tasty and deep Spanish flavor.